Which Mitt Will Show Up at the Debate? The Washington Post's Eugene Robinson says that the Republican's task in Denver will be more difficult than President Obama's because he'll have to explain who he is and what he believes. Wednesday's presidential debate promises sharp contrasts. One candidate wants to repeal Obamacare, one candidate invented it. One opposed the auto industry bailout, one takes credit for it. One doubts the scientific consensus about climate change, one believes in it. One wants to "voucherize" Medicare, one wants to save it. One dismisses nearly half of Americans as a bunch of moochers, and one claims to champion the struggling middle class. It promises to be an epic clash: Mitt Romney vs. Mitt Romney. Oh, and President Obama will be there, too. In theory, the first general-election debate is a trailing candidate's best opportunity to hit the reset button. New Jersey Gov. Chris Christie (R), doing surrogate's duty on the Sunday morning shows, acknowledged that Romney has had a "tough couple of weeks" but promised the debate would change just about everything. "This whole race is going to be turned upside-down come Thursday morning," he said on CBS's "Face the Nation." In practice, debates are rarely decisive. In only a few presidential elections have they demonstrably moved the needle. Perhaps this is one of those years, perhaps not. 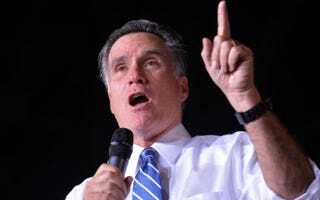 It seems to me that Romney's prospects Wednesday night will depend heavily on his ability to explain why he has taken so many different positions on so many issues. Read Eugene Robinson's entire piece at the Washington Post.